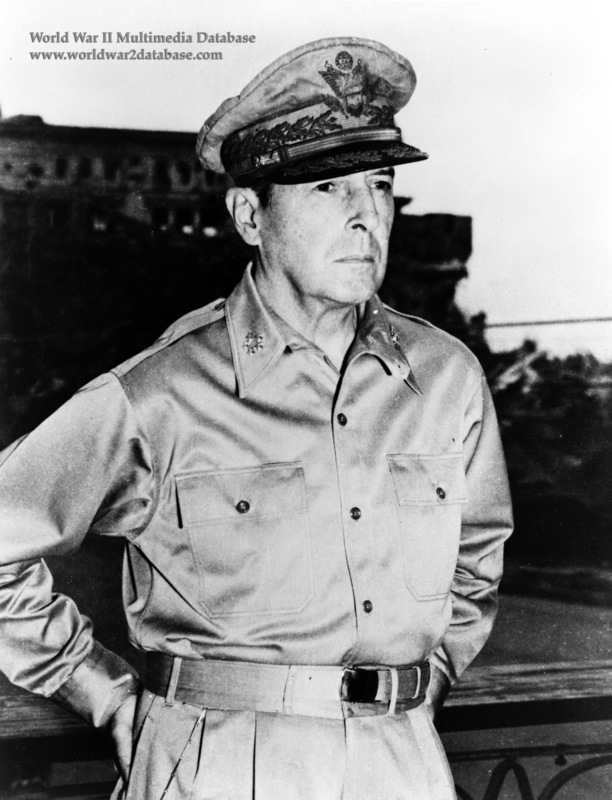 US Army General Douglas MacArthur photographed just after sixteen Japanese envoys were flown from Ie Shima to Manila to discuss surrender terms. After a number of false starts as no Japanese officer would willingly serve on the delegation, they flew in two G4M-1 (Allied code name "Betty") bombers with the call sign "Bataan" to Ie Shima, and then a C-54 flew them to Manila. MacArthur, seeking to enhance his status in the eyes of the Japanese, refused to meet with them. US Army Major General Charles Willoughby, born in Germany and MacArthur's Chief of Intelligence, was detailed to meet with them. He conversed in German with Imperial Japanese Army General Toroshiro Kawabe. At the Rosario Apartments, Willoughby set the date for the first American landings at Atsugi Airfield, and worked out the first draft for the Instrument of Surrender. The Japanese worried that right-wing elements of the military would try to attack the first Americans to land, and admitted that the government may not have control of the situation. However, both the first landing by Colonel Charles Tench on August 28 and MacArthur's landing on August 30 were unmolested. Willoughby went on to support extreme right-wing organizations in the United States. MacArthur referred to him as "my little fascist."